The United States Love Skywriting forever stamp will be issued Jan. 7 in Chino, Calif., with a first-day ceremony that will be followed by a skywriting demonstration, weather permitting. A small white airplane spells out “Love” in skywriting on a fanciful new forever stamp from the United States Postal Service. 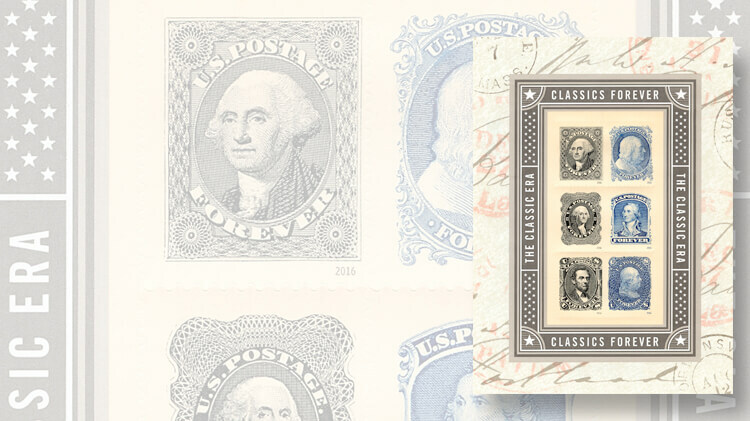 The latest entry in the U.S. Love stamp series is being issued Jan. 7 in panes of 20. If the weather cooperates, the 10 a.m. first-day ceremony in Chino, Calif., will be followed by a skywriting demonstration “to replicate the stamp image,” scheduled for noon. These events are taking place at the Planes of Fame Air Museum, 7000 Merrill Ave., No. 17, in Chino. The program will begin with a discussion about a World War II Curtiss P-40 Warhawk and how the plane was used for mail delivery during the war, according to the Postal Service. The scheduled ceremony participants are USPS Chief Operating Officer and Executive Vice President David Williams, Vice President and Chief Development Officer of Operation Gratitude Chris Clark, Skytypers President Stephen Stinis, Skytypers CEO and Squadron Commander Greg Stinis (the skywriter pilot), and Planes of Fame Aviation Historian and Air Museum Moderator Kevin Thompson. Online voting open for 2016 U.S. stamp popularity poll: In 2016, the United States Postal Service issued 154 varieties of stamps and postal stationery. If the weather presents a problem, the skywriting demonstration will be rescheduled for the following day. “The Love Skywriting stamp will add a sweet, romantic touch to letters and cards, not only on Valentine’s Day, but all year round,” the Postal Service said in its stamp announcement. Louise Fili designed the stamp and its typography. It was illustrated by Jessica Hische, with Derry Noyes serving as art director. This is the fourth U.S. Love stamp design for Hische, a freelance illustrator and letterer based in San Francisco, Calif. The 2012 Love Ribbons forever stamp shows her illustration of the word “Love” spelled out with curling ribbon (Scott 4626). Hische also illustrated the 2013 Sealed with Love forever stamp; her design conveys an envelope flap closed with a red wax seal containing a heart set within a circle of delicate curling ornamentation (4741). The two Forever Hearts Love stamps issued Jan. 22, 2015 (Scott 4955-4956), were designed and illustrated by Hische with art direction by Antonio Alcala. The first U.S. Love stamp, with a graphic design based on Robert Indiana’s Love sculpture, was issued with an 8¢ denomination in 1973 (Scott 1475). The Postal Service began issuing Love stamps more frequently in 1982, and in all has issued some 50 stamps with the Love theme, including major varieties showing similar designs. Love has also been the subject of several stamped envelope issued by the USPS. Since 2006, the Postal Service has also routinely offered pairs of stamps designed for use with wedding announcements and reply envelopes, denominated with 1-ounce and 2-ounce rates. The art of skywriting is documented as early as 1915, just a dozen years after the Wright Brothers’ history-making flights at Kitty Hawk, N.C. In an online series on the history of flight, NBC News reported that stunt pilot Art Smith used flares to accomplish a form of skywriting on the closing night of the Panama-Pacific International Exposition in San Francisco. “Smith later went on to work for the U.S. Post Office as one of the first air mail pilots,” according to NBC. Over the years, skywriting pilots have used oil products heated with airplane engine exhaust to create the smoke for letters and symbols that convey messages in the sky. Skywriting was featured on a British nondenominated first-class stamp in 2002 to express the message “hello” (Scott 2025). The same British design was later adapted on smaller stamps in 2005 (2315), and 2008 (2537). Technical details and first-day cancel ordering information for the U.S. Love Skywriting forever stamp can be found in the box on this page TK. FIRST DAY— Jan. 7, 2017; city— Chino, Calif., and nationwide. DESIGN: illustrator— Jessica Hische, San Francisco, Calif.; designer and typographer— Louise Fili, New York, N.Y.; art director— Derry Noyes, Washington, D.C.; modelers— Sandra Lane and Michelle Finn; series— Love. PRINTING: process— offset with microprinting; printer and processor— Banknote Corporation of America, Browns Summit, N.C.; press— Alprinta 74; inks— spot blue; paper— phosphor tagged, overall tagging; gum— self-adhesive; issue quantity— 250 million stamps; format— pane of 20, from 320-subject cylinders; size— 1.05 inches by 0.77 inches (image); 1.19 inches by 0.91 inches (overall); 5.635 inches by 5.425 inches (full pane); 22.54 inches by 10.85 inches (press sheet); plate numbers— B followed by one single digit; marginal markings— plate numbers in four corners (stamp side); “©2016 USPS,” USPS logo, bar code 561600 in upper right and lower left corners, promotional text (back side); USPS item No.— 561604. Standard ordering instructions apply. Collectors requesting first-day cancels are encouraged to purchase their own stamps and affix them to envelopes. The first-day cover envelopes should be addressed for return (a removable label may be used), and mailed in a larger envelope addressed to Love Skywriting, Stamp Fulfillment Services, Cancellation Services, 8300 NE Underground Drive, Pillar 210, Kansas City, MO 64144-9998. Requests for first-day cancels must be postmarked by March 7. The Postal Service’s uncacheted first-day cover for the Love Skywriting stamp is item 561616 at 91¢. USPS order numbers for stamps and FDCs also appear in Linn’s 2017 U.S. Stamp Program on page 35 of the Jan. 2, 2016, print issue.